We buy our contact lens solution from Costco in those two-in-a-box packs that also come with two free contact lens cases. I'm willing to bet lots of people buy the very same product so this tip may go a long way! Rather than using a pen or marker to tell your cases apart, a simple trick we employ here is to just swap the caps and pick a color. Then, from now until eternity, your assigned lens case is always green (or white, if you prefer). This also makes it really easy to tell apart the lens cases that you're using to store lotion or hair gel since those cases won't get the solid color treatment. (Yes, these extra cases are very useful for storing about 3-4 days worth of hair gel or facial lotion, too). In case you're wondering how you'll tell apart your Left vs. 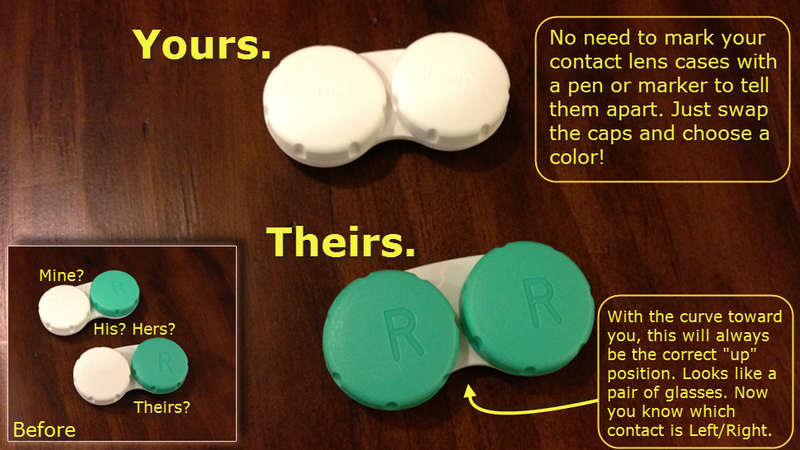 Right contact lens, here's how: Notice the shape of the case? If you hold it with the curve on the bottom, that's what I consider the "up" position. The curve even looks like the bridge on a pair of glasses if you were about to put them on your face. Now that you've got your bearings, you'll always know which side is the "right" contact lens.